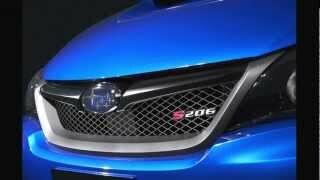 Based on the 4-door SUBARU IMPREZA WRX STI, S206 is the newest model in STI’s “S” series. This series dons the crown of STI tuned cars with advanced driving performance and exclusively-made items in both interior and exterior designs. 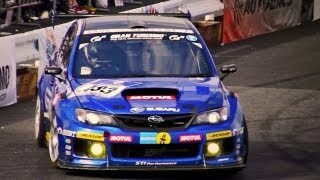 As with former STI models such as S204 and R205, S206 is founded on the IMPREZA WRX STI line. 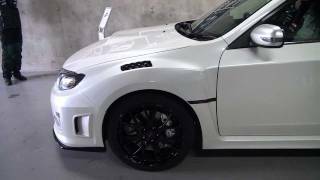 Tokyo, November 24, 2011 – Subaru Tecnica International Inc. (STI)*1 is pleased to announce the launch of the SUBARU IMPREZA WRX STI “S206”, special performance edition. The model will go on sale today through Subaru dealerships in Japan. In addition, “NBR CHALLENGE PACKAGE” model will be released to commemorate the class win*2 at 24 Hours Nürburgring endurance race held in June, with the addition of a carbon roof and original dry carbon rear spoiler. The exterior design incorporates racing car motifs and has an enhanced sporty feel. S206’s body and engine were tuned to perform as expected of STI’s best model. The body employs exclusive Bilstein shock absorbers, STI coil springs, a flexible tower bar (front), and a flexible draw stiffener (front). While improving straight-driving performance, motion is steadied when going into corners so that precise and quick turning is possible. Plus, “Michelin Pilot Super Sport” tires provide refined driving comfort in combination with “BBS” 19-inch aluminum wheels made only for this model. In the exclusively-made engine, the weight balance between piston, connecting rod, and crankshaft is optimized to enhance the rev feel. Along with a ball bearing turbocharger, ECU (Engine Control Unit) with STI tuning, and a sports muffler with lowered back pressure exhaust - all of which were designed for this model - the engine can deliver 235kW (320PS) in maximum output and 431N.m (44kg.m) in maximum torque. The accelerator response is heightened and low to mid range torque increased, thereby offering better driveability. In the interior are exclusively-made items such as a genuine leather-wrapped steering wheel, “RECARO” racing bucket seats, and seatbelts. Together they create a refined appearance and feel, appropriate for this flagship model.